Fusidic acid is a bacteriostatic. Fusidic acid is effective primarily on gram-positive bacteria such as Staphylococcus species, Streptococcus species. Fusidic acid acts as a bacterial protein synthesis inhibitor by preventing the turnover of elongation factor G (EF-G) from the ribosome. 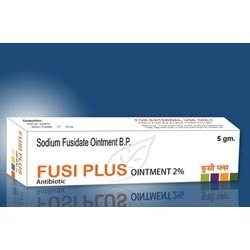 Fusidic acid is especially used in bacterial skin infections. Fusidic acid is active against Staphylococcus aureus, most coagulase-negative staphylococci, Beta-hemolytic streptococci,Corynebacterium species, and most clostridium species. Fusidic acid has no known useful activity against enterococci or most Gram-negative bacteria. Fusidic acid is active and clinically against Mycobacterium leprae but has only marginal activity against Mycobacterium tuberculosis. Povidone/iodine solution is an antiseptic combination. It works by killing sensitive bacteria. Povidone-iodine is a broad spectrum antiseptic for topical application in the treatment and prevention of infection in wounds. Reduce infections & inflammation. IODIN PLUS OINTMENT is the broad spectrum multi purpose Antiseptic cream. 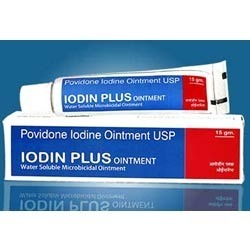 IODINE PLUS OINTMENT is effective in Wounds , Traumatic injuries & Burns. Looking for Antifungals, Antibiotics & Antipruritics ?